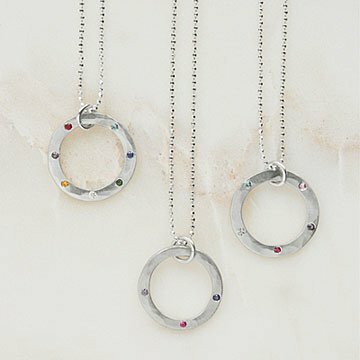 Carry the endless love you have for your family with Canela Lemoine's delicate circular pendant. Some of history's great theorists believed that time, life, and love flow in infinite cycles. Embodying that sentiment, this shimmering pendant represents the eternal bond you share with your family. Canela Lemoine handcrafts each design from sterling silver. She then nestles up to six birthstone gems into the ring to reflect each of your loved ones. It's an understated piece to wear every day, yet it holds a universe of meaning in each shimmer and sparkle. Handmade in California. Pendant: 1" Dia, Chain: 18"
Gently polish with a silver cloth. Love this necklace, I'll end up getting one for myself soon!! I loved the product...already ordered two more!